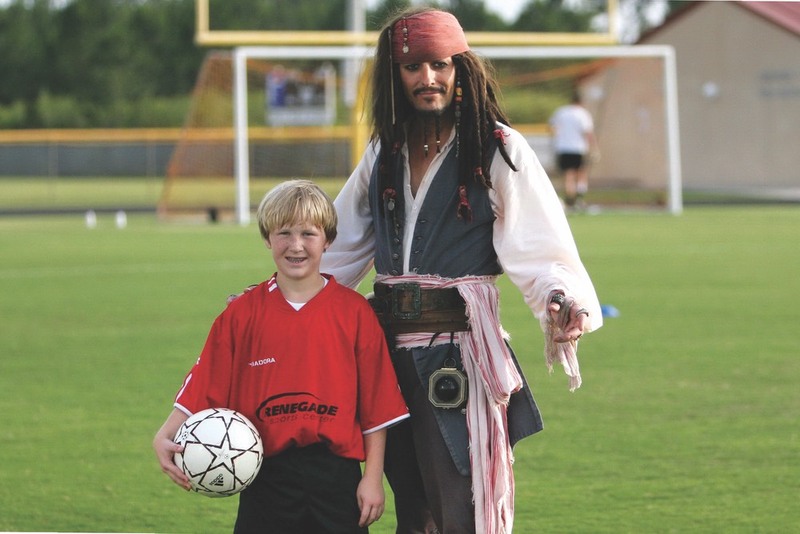 There is a new game in town, and it is the Panama City Beach Pirates soccer team. The Pirates were inspired by local visionaries Laird Hitchcock (team owner) and Carey Turner (general manager). For the past four years, Hitchcock and Turner have been running one of the most successful indoor sports facilities in the Florida Panhandle. Renegade Sports Center gives locals the opportunity to enjoy various indoor sports under one roof. 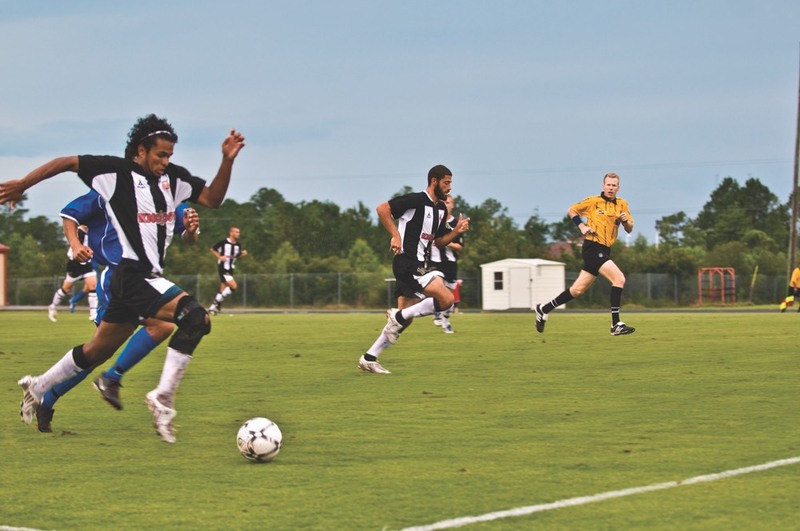 With their involvement in all things sports-related, especially youth soccer, Hitchcock and Turner were inspired to introduce their own competitive men’s amateur soccer team to the Northwest Florida area. 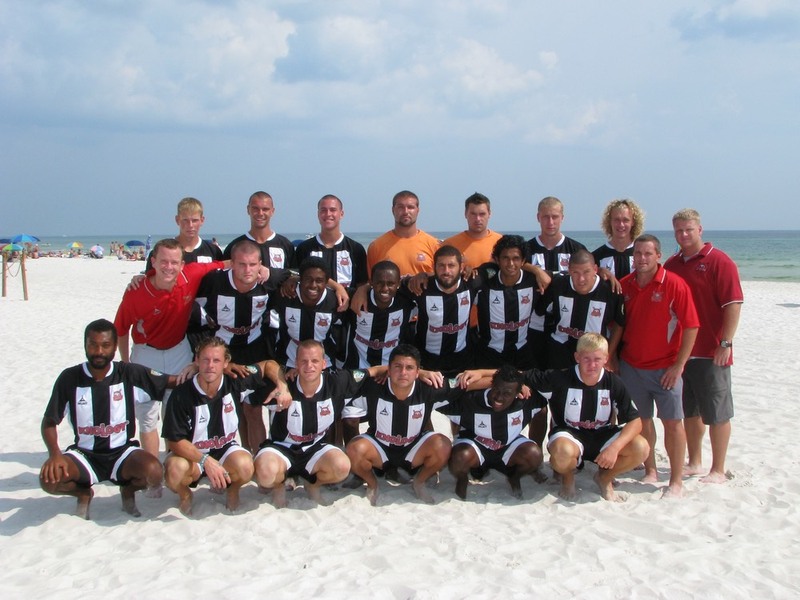 In August of 2007, Laird purchased franchise rights from the United Soccer Leagues (USL) and founded the Panama City Beach Pirates. They are in the Premier Development League (PDL), a branch of the USL which serves as a proving ground for future professional players, similar to the AA and AAA leagues in Major League Baseball. It was not long before Laird asked University of West Florida (UWF) men’s head soccer coach Bill Elliott to take the helm for the Pirates’ maiden voyage. Coach Elliott was more than happy to relocate his family from Pensacola to Panama City Beach for the duration of the season. He said, “It is a great way to enjoy the ‘World’s Most Beautiful Beaches’ and to follow my passion to coach top-level soccer. With the Pirates’ season being in the late spring and summer months, it still allows me to continue my coaching duties at UWF.” Coach Elliott is rated as one of the top twenty coaches for Division II soccer in terms of career wins and winning percentage. He has led the UWF Argonauts for the last thirteen seasons, and has seven Gulf South Conference Coach of the Year awards and four South Region Coach of the Year awards to his credit. It was rough sailing for Coach Elliott and the Pirates in their 2008 inaugural season. They started out slow, going without a win until midway through the season. Then, the wind hit their sails and they had a seven-game stretch without a loss. They were in the running for the playoffs until the final two games of the season. The word is now out around the league about the professionalism of the Pirates organization. Coach Elliott said it is like coaching a high-level college all-star team. Most of the players are the best players on their college teams, and they even have some All-Americans. But they also have to abide by NCAA rules so the players can keep their eligibility. They cannot be paid, but are only allowed room and board. For away games, they are also provided transportation and accommodations. The Pirates’ living quarters are atypical of those that might be found on the Black Pearl. They live at the beautiful Origins condominium at Seahaven in Panama City Beach, which gives opposing teams the revelation that this is a first-class organization. The players have full access to Renegade Sports Center, where there is a full workout gym and a state-of-the-art indoor soccer field equipped with artificial turf. They also have basketball courts and an indoor skate park. So come out and support your Panama City Beach Pirates. It is great family entertainment, and the level of play is second to none. The games are played at Mike Gavlak Stadium (Arnold High School) in Panama City Beach. When you arrive at a game, the atmosphere is charged with enthusiasm. You will find energetic music playing during warm-ups, and the smaller kids can enjoy a Moonbounce and face painting. The Pirates’ mascot, “Captain Jack Sparrow,” entertains the kids by leading the cheers, posing for photos, and occasionally sneaking up to give them a good pirate fright. You may even think he is Johnny Depp. The team players are very accessible and will stick around after games to mingle with fans and sign autographs. You can even pose for photos with your favorite player. Fair winds to the Pirates this year, as expectations are high. They plan on taking all the loot by making it to the playoffs. See you at the game, matey! 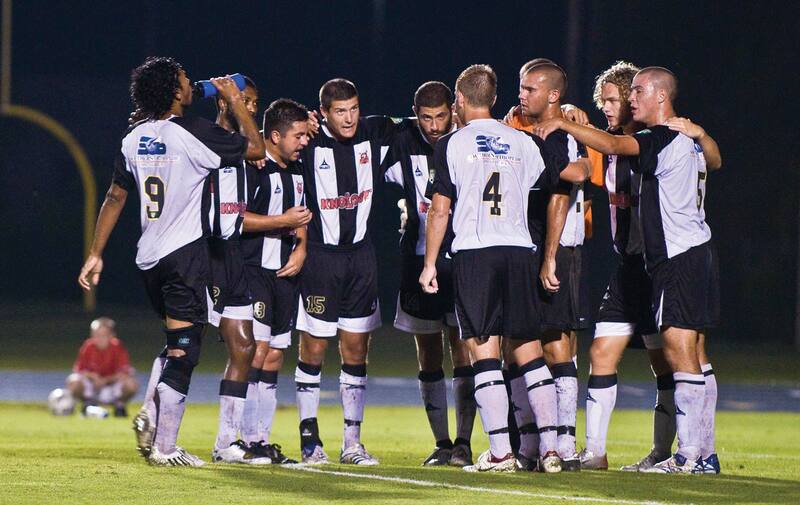 Check out the Pirates’ website for more details and information, including 3v3 tournament and 2009 Game Schedule. www.panamacitypirates.com. Or by contacting Carey Turner via e-mail at carey@panamacitypirates.com, by calling (850) 248-HOOK (4665).